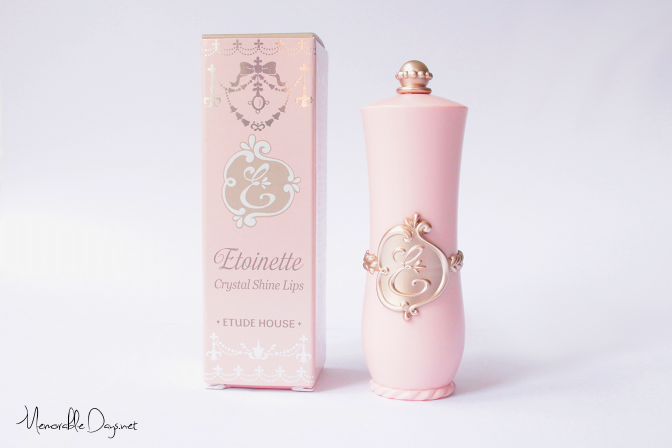 Review+Swatches: Etude House - Etoinette Lipstick PBE101 | Memorable Days : Beauty Blog - Korean Beauty, European, American Product Reviews. 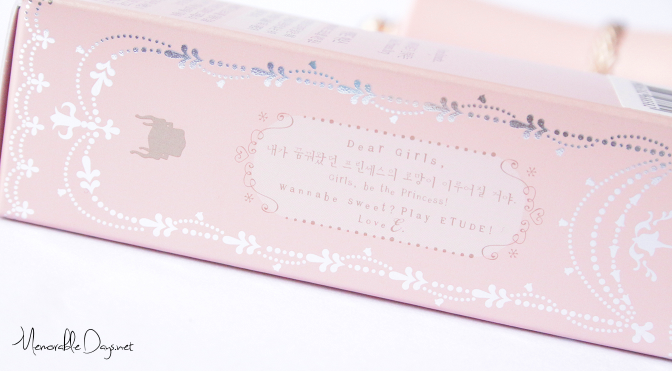 I've been blogging a lot about Etude House lately. I'm not sponsored or affiliated with them. I just love their packaging and I'm a huge sucker for cute packaging which is why I talk about it so much haha. You probably have seen my blogpost about the gorgeous Princess Etoinette collection right? (link to the blogpost) Today I will be reviewing the Crystal Shine Lips lipstick of this collection in the color PBE101, the lightest shade. This smooth and creamy lipstick delivers a surge of moisture and it has a soft shimmer finish, giving your lips a gorgeous healthy look. The lipsticks are available in 6 colors (see picture below). The sample image provided by Etude House shows the actual color of PBE101 pretty well. You can also create “bitten lips” (also called as ombre or gradient lips) with some colors such as with PPK001 and PPK002 ^^. Unfortunately you can't really create it with the PBE101 that I have, since the color is quite natural looking. WHERE TO BUY ETOINETTE LIPSTICKS? You can purchase these lipsticks at Cosmetic-Love.com (link to the product) which is one of my favorite webshops who sells affordable Korean beauty products. 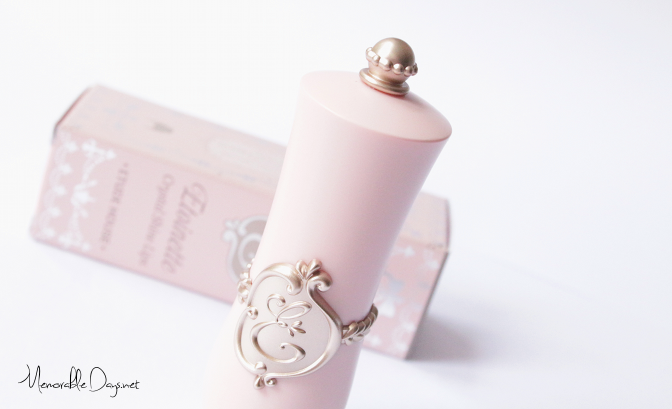 They do sell more products from the Princess Etoinette collection, so check their assortment out: http://cosmetic-love.com. This lipstick is sold for $16.98 including free shipping. The packaging is to die for. It looks so princess-y, dreamy and girlish! This whole collection is designed by Sylvia de France, a designer. Who won't like this gorgeous packaging? Even the cap looks gorgeous! Text on the packaging: "Wanna be sweet? Play Etude! Love E."
The color is written at the bottom of the lipstick as well as the production date. This product is brand new, since its made on 2012-11-12. As you can see the Etoinette logo is also on the lipstick, so pretty huh?! The color PBE101 is a peach color with a cool undertone. 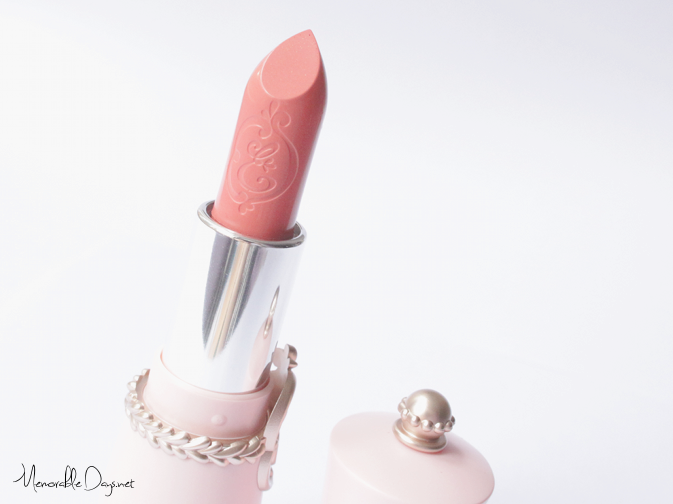 This lipstick does have a scent of roses, but thankfully its light and you won't be able to smell (or taste) it when its on your lips, only when you apply it. I always prefer scentless beauty products. I'm glad that the scent of this lipstick isn't overwhelming :). Most Asian lipsticks I’ve tried has a sheer coverage. I'm not surprised that this one has a light pigmentation as well. However, you can easily build it up to make the color more visible. When you swatch it on your hand you will notice that there is glitter in the formula, but on the lips it disappears and it gives you a creamy/glossy finish. It has a very creamy texture, so it applied almost balm-like. I love it that it felt moist on my lips too. The swatch in the picture below shows the actual color. The color is noticeable on my lips. As you can see in the pictures below, it looks very natural and no shimmer is visible, it just looks creamy and glossy. The lasting power is so-so. It doesn't last long if you drink a lot, but it does last at least 2,5 hours if you don't drink. Overall this is a decent lipstick, but it is nothing special. 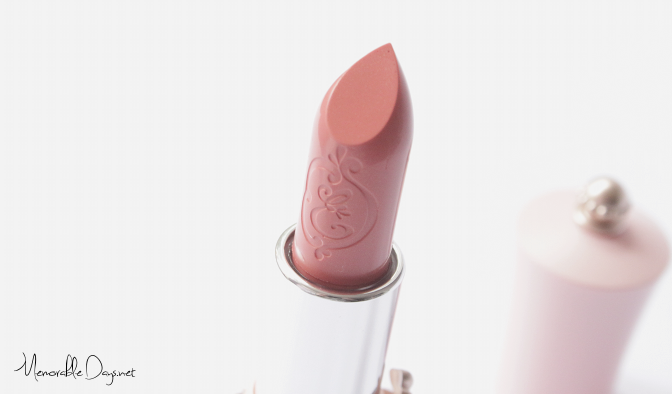 The gorgeous design of the lipstick is the most stunning aspect of this product (this was the reason why i bought it). You can easily apply this every day since it looks natural on the lips and it's moist so you can replace this with your lip balm if you want to. I wished that the wear time was longer though. You need to re-apply every 2,5 hours or so, otherwise you won't be able to see the color anymore. This is also the reason why you’ll use it up quite quickly. However, I sure will put this in my make up bag, because the packaging just looks stunning!! Would you like to purchase this lipsticks or any other product of the Princess Etoinette collection, you can visit www.cosmetic-love.com. ps. i'm sorry about the lighting in this blogpost. it was so dark that day so i really had a hard time taking pretty pictures.